I was lucky enough to meet up with a group of Indonesian board game designers who were in London as part of the London Book Fair. We played some games at Draughts, Waterloo, played some games, talked about the industry in our respective countries and I got some great games to take home, play and talk about! The first of these is Stockastic! As the name suggests, Stockastic is all about stock trading. Build your portfolio to be the wealthiest stock trader by the end of the game. Place all four company boards in the middle of the table, choose which sides to play randomly. This is the market. 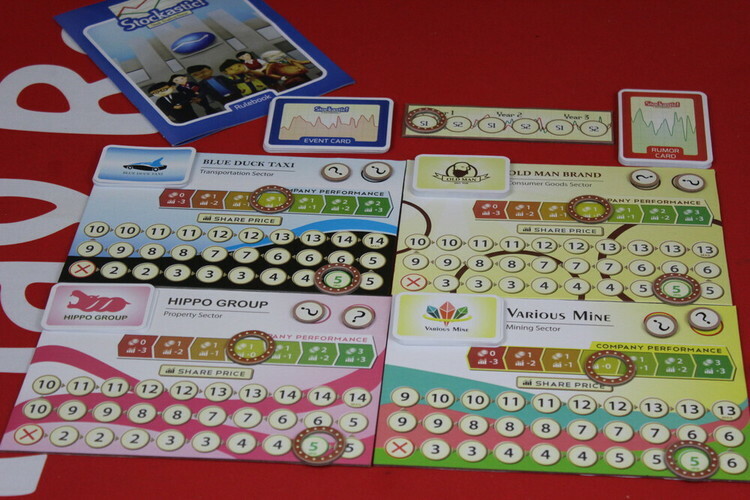 Place the appropriate number of share cards on each board, depending on the number of players. 7/10/12 or 15 for 3/4/5 and 6 players respectively. Place a marker token on each company's starting price, this is marked on the boards. Place another marker token in the centre of the performance indicator on each company board. Randomise the forecast tokens and place one face down on each forecast slot on every company board. Shuffle the rumours deck and the event deck and place them both above the board. Give each player their starting fund (30 coins in a 3 or 4 player game, 25 coins in a 5 or 6 player game) Place a marker token on the round tracker for the first semester of the first year. You are now ready to play! The game is played over the course of six rounds, with each round being split into four phases. At the beginning of the bidding phase, the first unrevealed forecast token on each company is revealed. Then players bid for turn order. Each player places the amount they wish to bid in their hand secretly when everyone has decided, bids are revealed. The player who bid the most goes first, the next highest and so on, they are then given the appropriate turn order marker. In the case of a tie the player who went earlier in the last round goes first. Check the forecast token - A player may pay two coins to the bank to peek at one face down forecast token on a company board. Check the event deck - A player may pay three coins to peek at the top card of the event deck. Buy/Sell shares with the market - You may buy shares from any company. Pay the shown amount to the bank for each stock you buy. The price of that stock then moves up one for each share you bought. You may also sell stock back to the market. The price you sell for is one less than the current price shown. After selling, move the price marker down one for each share sold. You may not buy and sell shares from the same company in the same turn. Also, if you buy or sell more than five shares from the same company, the price can only move up or down by a total of five. Buy/Sell shares with another player - Players may buy and sell shares to other players during their turn. All deals must be for cash only, no share trading is allowed. The amount and price of shares is negotiated openly between players. Trading with other players does not affect share price in the market. Resolution Phase - After all players have taken their actions, the resolution phase happens, this is where changes to the market are made. First, resolve the current forecast tokens, the arrows indicate if the companies performance increases or decreases, move the marker token for each company appropriately. Then reveal the top card of the event deck and resolve it. These cards affect company performance or stock price, adjust all markers accordingly. If any rumour cards were played on companies, resolve these next. Then, check each company's performance and adjust the price of that company's shares. Price increases if performance is on the right of the bar and decreases if it is on the left. If a company stock price ever drops to the lowest marked price, that company is declared bankrupt. 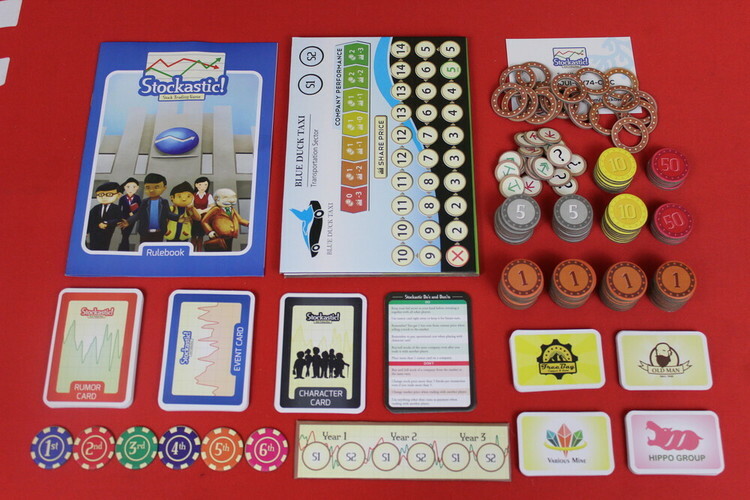 All shares held by players for that company are returned to the box, any rumour cards or forecast tokens on it are discarded and the board is flipped over. This represents a new company taking over and filling the space left behind by the previous one. Set the starting price and performance indicator and place forecast tokens on the appropriate spaces. Place shares on the company board, ready to start trading straight away. After all changes have been resolved for each company, each player receives their dividends for companies they have invested in. For each share players have in a company, they receive an amount of money based on each company's current performance. After six rounds, the game ends. 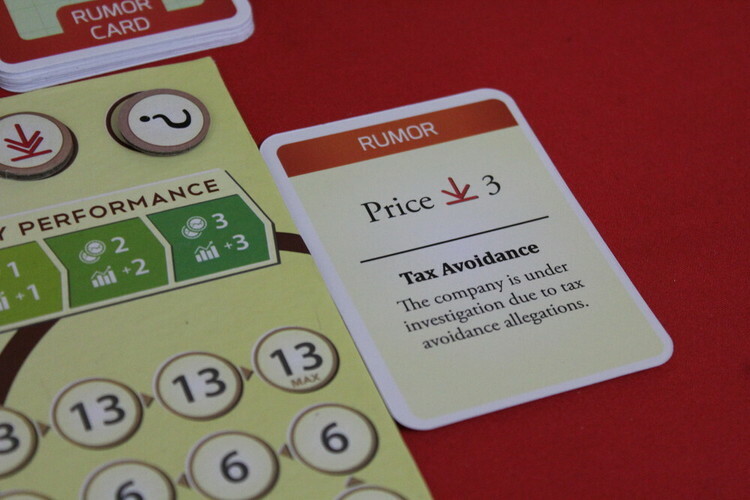 Each player counts up their coins then adds the current value of their stock to the total, the current value of stock is as indicated on the company boards. The player with the most assets wins! If there is a tie, the player with the most stock wins. 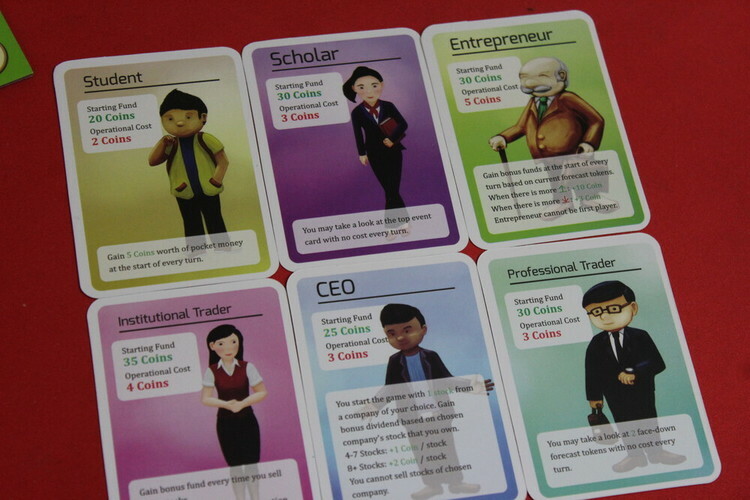 The game comes with character cards which can be added to the game for a little more depth. These mean players start with different amounts of money and have additional benefits. 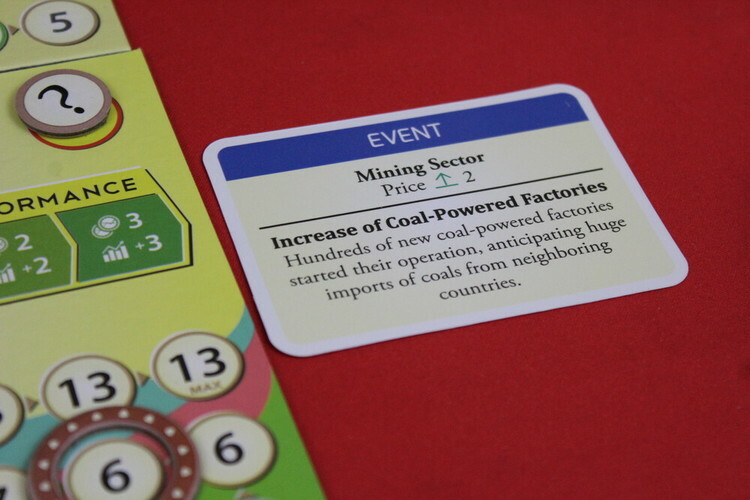 The downside is you also need to pay operational costs at the end of each round (after receiving dividends) If, at any point, a player is unable to pay their operational costs, the player goes bankrupt and is out of the game. At it's heart Stockastic is a simple stock investing game, buying makes the value of a company go up, selling makes it go down. But life in the stock-market is not that simple or everyone would be doing it. The forecast of each company can be seen, yet Events revealed in the resolution phase and played Rumours affect the performance of the market positively or negatively. It's your job as a savvy Trader to ride out the uncertainty and become the most Stockastic individual.